Las Casitas overlooks the turquoise Caribbean waters of Puerto Morelos. 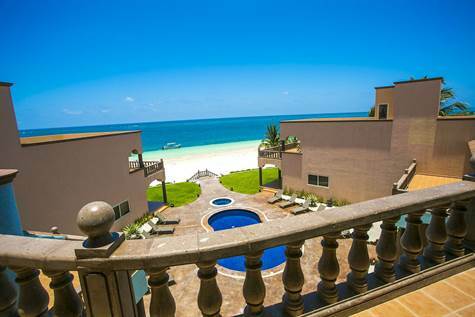 You will love the hacienda architecture but still enjoy the best of modern amenities, suitable for coastal living. The units’ large size make them comfortable for long term stays while enjoying the very best in outdoor living! Expansive covered terraces, wide beaches, rooftop terraces, and spacious common areas allow the opportunity to truly enjoy the warm breezes and Mexican sun. The common areas lie in front of the widest, white sand beach in the Riviera Maya. The beach is groomed daily by the city, ensuring year round enjoyment. You are just a short beach stroll to ocean side restaurants and casual beach bars. The large pool features a shallow portion for children, and the hot tub is a great place to watch the waves with a margarita in-hand. Chaise lounges provide plenty of areas for enjoying the sun. Large potted plants create a tropical atmosphere. Gated entries on beach and street sides ensure privacy. Off-street parking is offered for each unit, with additional guest spaces. An elevator services the condominiums and penthouse units, making access to upper units easy.